I’m looking around to make sure we’re alone & my mom isn’t anywhere within earshot … Somehow or another that woman always knows what I’m up to. She used to claim she had eyes in the back of her head. Ok, I think we’re alone … You’re not wearing a wire, are you? Cuz I’m going to do something that she has forbid me to do: I’m going to share one of her recipes & DO NOT TELL HER I TOLD YOU. I promise, I will deny it, I will say I don’t know you & that I heard you used to reside in Danvers State Insane Asylum after you were caught walking naked down the highway claiming you were Emeril Lagasse’s lover … and I’m a pretty decent liar. My mom is very protective of her recipes & I get that, but I’m also a pretty good judge of things, and I know which ones I absolutely CANNOT share, (like her famous potato casserole & the addictive cheese ball – both of which always ensure I am invited to lots of parties & pot-lucks,) but this one – well, this one is kinda standard, and I suppose you could find a similar one on the web somewhere, (though I’ve never bothered to look.) Plus, I’m still feeling in the holiday spirit of giving. Zucchini Bread. The beloved bread of Christmastime – the one little loaf that will make you want to be my friend forevermore. Now, I suppose it makes sense that if YOU could make the zucchini bread yourself, you wouldn’t have much use for me, but did you know that I’m a ton of fun & I pour really healthy glasses of wine when you come over to my house, and I’m the world’s best secret keeper? Well, besides this bread secret, I am. In a big mixing bowl (I use my badass standing mixer for this) combine eggs, oil, sugar & zucchini. In a separate bowl, sift together the flour, cinnamon, salt, baking powder & baking soda & gradually add it to the zucchini mixture. Mix thoroughly & then add the vanilla & the nuts. Bake in greased 3×6 loaf pans at 350 degrees for about 35-45 minutes (I check after 35 & then always end up baking them 5-10 mins longer.) If you use the larger loaf pans, bake for an hour (but check after 45 minutes if you’re neurotic like me.) And I have also made zucchini muffins in the large muffin pan (makes a dozen) and those take about 25-30 minutes. These make great gifts for neighbors & friends! But The Husband & The Boy like to eat slices fresh from the oven with a little butter or cream cheese … YUM! And I mean, they are healthy – they have zucchini in them, so how can they be anything BUT healthy? Now, for my photography disclaimer: I take all most of the pictures myself, and as you can clearly tell, I’m no pro. I’m a multi-tasking mom with a mixer & a hungry family. Most of my food photos are taken with my iPhone, right before I sit down to devour my meal. This one happened to be taken with my Cannon Rebel because it was sitting out waiting for Christmas to arrive. My food photos are inferior, just look at my bestie’s gorgeous website, The Kitchen Snob & you will see why I feel like the ugly step-sister. She spends countless hours with in her semi-professional studio, gently massaging crumbs off of cookies & perfectly placing them so that your mouth will water when you browse her site. 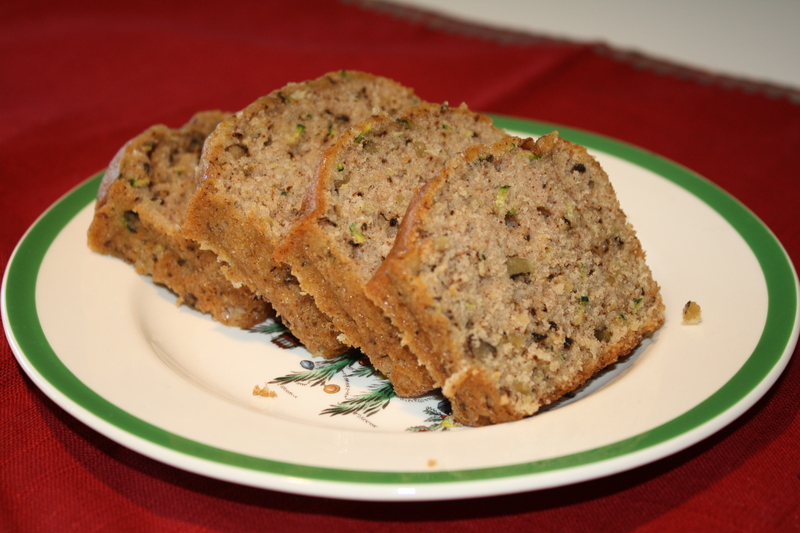 Ok, enough whining — I”m going to go heat up a slice of zucchini bread & have my coffee now.